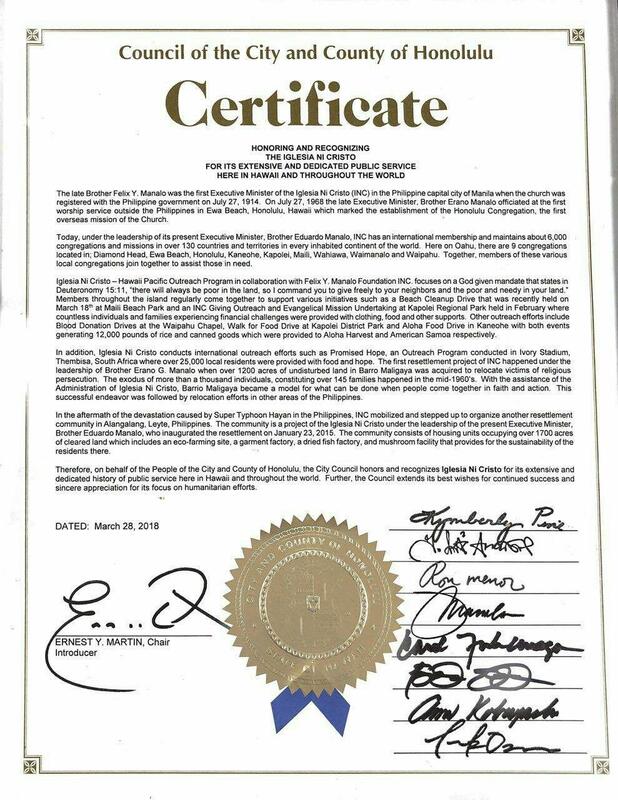 (Eagle News) — The Council of the City and County of Honolulu in Hawaii issued a certificate “honoring and recognizing the Iglesia Ni Cristo for its extensive and dedicated history of public service” not just in Hawaii, but also throughout the world. The certificate, signed by all nine Honolulu City Council Members, was introduced by Council chair Ernest Y. Martin and was issued on Wednesday, March 28, 2018. This came about as the Church is preparing for its May 6 Worldwide Walk to Fight Poverty, and four months ahead of the July 27, 2018 start of year-long celebrations of the Church’s 50th year anniversary of its overseas mission. It was in Honolulu, Hawaii where the INC held its first ever worship service outside the Philippines on July 27, 1968. The Honolulu City council cited the many outreach and community service programs that the INC or the Church of Christ had conducted in Hawaii, as well as in other parts of the globe. “Members throughout the island regularly come together to support various initiatives such as a Beach Cleanup Drive that was recently held on March 18 at the Maili Beach Park and an INC Giving Outreach and Evangelical Mission Undertaking at Kapolei Regional Park held in February where countless individuals and families experiencing financial challenges were provided with clothing, food and other support,” the Honolulu City Council’s certificate stated. “Other outreach efforts include Blood Donation Drives at the Waipahu Chapel, Walk for Food Drive at Kapolei District Park and Aloha Food Drive in Kaneohe with both events generating 12,000 pounds of rice and canned goods which were provided to Aloha Harvest and American Samoa respectively,” it said. Events such as these have spanned the last 50 years of the Church’s history on the islands, which led all members of the Honolulu City Council to declare support for the INC’s history of being “a model for what can be done when people come together in faith and action”, as stated in the sealed City and County Certificate. Aside from Council Chair, Ernest Y. Martin, all the other Council Members namely Kimberly Pine, Ikaika Anderson, Joey Manahan, Ron Menor, Carol Fukunaga, Brandon Elefante, Ann Kobayashi and Trevor Ozawa, signed the certificate. Brother Rey M. de Mesa, District Minister of the 19 Hawaii-Pacific INC congregations, accepted the certificate. “The history of humanitarian efforts of the INC began in the same decade that the INC arrived on this island – the 1960’s. We have maintained that commitment to be of service to our fellow islanders here ever since, and we are eager to participate in future events that will have a global impact, even beyond the State of Hawaii,” he said. The Church had also conducted several outreach programs in North and South America, Asia, Africa, as well as in Europe, aside from efforts to help those in the Philippines through the “Lingap sa Mamamayan” program. It also cited the resettlement and community livelihood project done by the INC in the aftermath of super typhoon Haiyan, also known as Yolanda, in the Philippines. The resettlement community in Bgy. Alangalang in Yolanda-hit Leyte was inaugurated by INC Executive Minister Brother Eduardo V. Manalo on January 23, 2015, or just over a year after the super typhoon hit the region on November 8, 2013. The EVM Self-Sustainable Resettlement Community consisted of housing units occupying over 1700 acres of cleared land, with an eco-farming site, a garment factory, a dried fish factory, and a mushroom facility that provided the livelihood and sustainability of the residents in the area. It should be noted that the Church’s first-ever resettlement and eco-farming community in Leyte, which benefited victims of super typhoon Haiyan came about after the INC’s historic and record-breaking February 15, 2014 Worldwide Walk for Typhoon Haiyan/Yolanda victims that set two new Guinness world records. 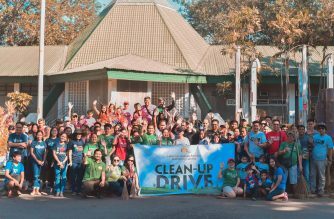 The first Guinness record set on February 15, 2014 — or on the day of the Church’s first Worldwide Walk — was for the largest charity walk in a single venue involving “validated” 175,509 participants in the Philippine capital in Manila. The second Guinness record achieved by the INC for this same event was for “the largest charity walk in 24 hours in multiple venues” with more than half a million participants worldwide – or 519,221 walkathon delegates — that was an altogether new Guinness world record. That first and historic INC’s Worldwide Walk for Yolanda victims was held across 13 time zones, in 29 countries and involving 135 sites, the last of which was in Hawaii which makes this United States County very important in the Church’s history. What makes Honolulu, Hawaii also significant in the INC’s history is that the Church’s first worship service outside the Philippines was held here, particularly in Ewa Beach, on July 27, 1968, officiated by the late INC Executive Minister Brother Eraño G. Manalo. The Honolulu Congregation was thus the first overseas congregation of the Church of Christ which also established the San Francisco congregation in California that same year. The Honolulu Council observed that since the INC was first registered in the Philippines on July 27, 1914 by the first INC Executive Minister, the late Brother Felix Y. Manalo in Manila, the Church had increasingly expanded its reach outside the Philippines. 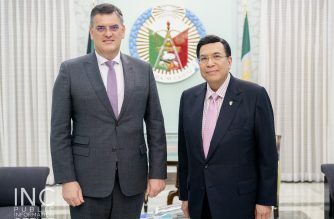 “Today, under the leadership of its present Executive Minister, Brother Eduardo Manalo, (the) INC has an international membership and maintains about 6,000 congregations and missions in over 130 countries and territories in every inhabited continent of the world,” the Honolulu Council noted. “Together, members of these various local congregations join together to assist those in need,” it said. The Honolulu city and county council also took note of the first resettlement project of the Church in Barrio Maligaya in Nueva Ecija where over 145 persecuted families from Hacienda Luisita in Tarlac were relocated in the mid-1960s. 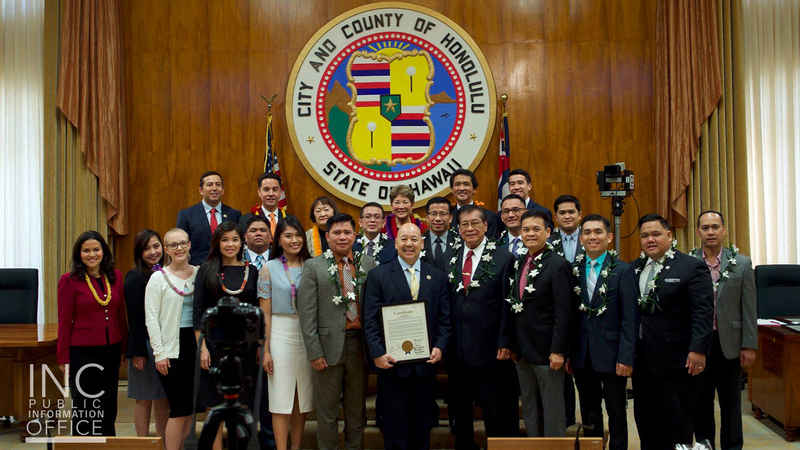 Therefore, on behalf of the People of the City and County of Honolulu, the City Council honors and recognizes Iglesia Ni Cristo for its extensive and dedicated history of public service here in Hawaii and throughout the world,” the City and County Council’s certificate read. “Further, the Council extends its best wishes for the continued success and sincere appreciation for its focus on humanitarian efforts,” it added. 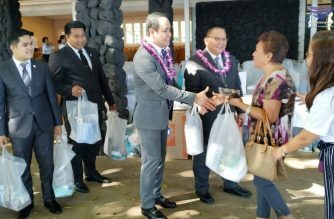 The awarding of the certificate of recognition by the Honolulu Council to the INC came as the Church is preparing the start of its celebration of the 50th year of its establishment of its overseas mission on July 27 this year. It also comes ahead of another worldwide walk to be conducted by Church members worldwide on May 6 which is expected to beat the Guinness records previously set by the Church four years ago. Five sites throughout the islands of Hawaii will participate in this year’s Worldwide Walk to Fight Poverty on May 6; Oahu’s walk will be held at Ala Moana Park. Proceeds of the global campaign will be used to provide food and medical assistance for those in immediate need in impoverished countries, including the continued development of the various eco-farming communities established in the Philippines and more recently, in Ladybrand, South Africa, the first INC eco-farming site outside the country. Outreach projects of the INC will ramp up as the INC prepares for the year-long celebration of its 50th Anniversary in the West – July 27, 2018. Celebrating a half-century of missions beyond the Philippine borders, congregations will be honoring the milestone by continuing and bolstering its global humanitarian presence.